Can we all just take a moment to appreciate the summer produce gift that is zucchini. I mean…honestly. You can eat is sweet and you can eat is savoury. You can eat it in a million and one ways and there will still be new way to eat zucchini. Not to mention it’s basically entirely made up of water so there are next to no calories in it. Which is really great because then my brain takes that fact as licence to go HAM on the cheese….because it’s all about balance…right? Case and point: These three cheese veggie filled zucchini ravioli stuffed with creamy ricotta and topped with mozzarella & parmesan. No regrets here, my friends. No regrets. There are a couple of ways you can go about to make your zucchini slices. The easiest way is to use a handheld Mandoline slicer so that you can adjust to the thickness you need. If you don’t have one of those you can also use a julienne peeler like this one to get long thin, pasta like noodles. 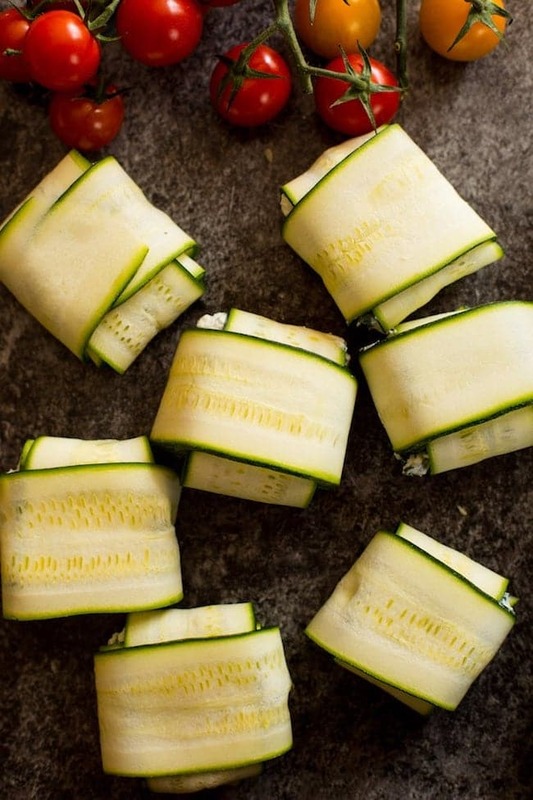 The key is to get the zucchini to be thin enough that you can roll it up without breaking, but still thick enough to hold up when stuffed and folded with cheese. Making the ‘ravioli’ parcels is actually pretty easy. You only need three strips to work with. Lay out the first two strips on a clean surface making a lower case ‘t’. Take the third strip and line it up with the bottom strip so your ‘t’ formation remains. 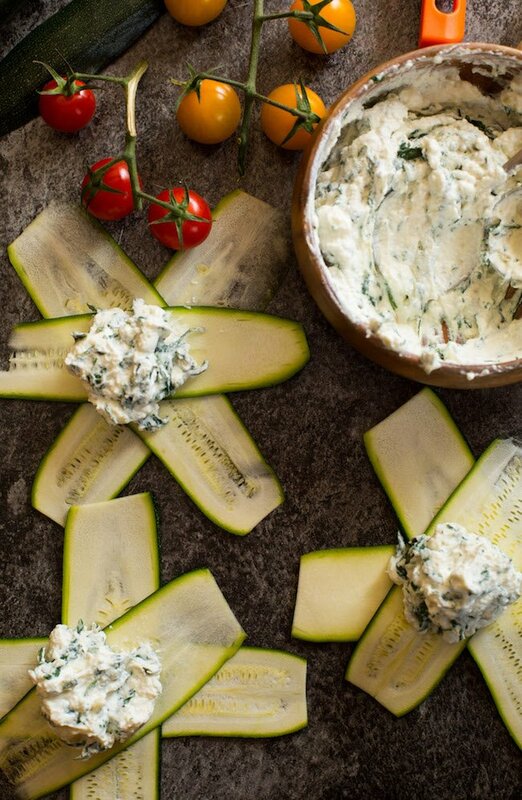 After adding your ricotta cheese mixture to the centre of the strips just fold up the sides one at a time until your zucchini looks like the picture below. 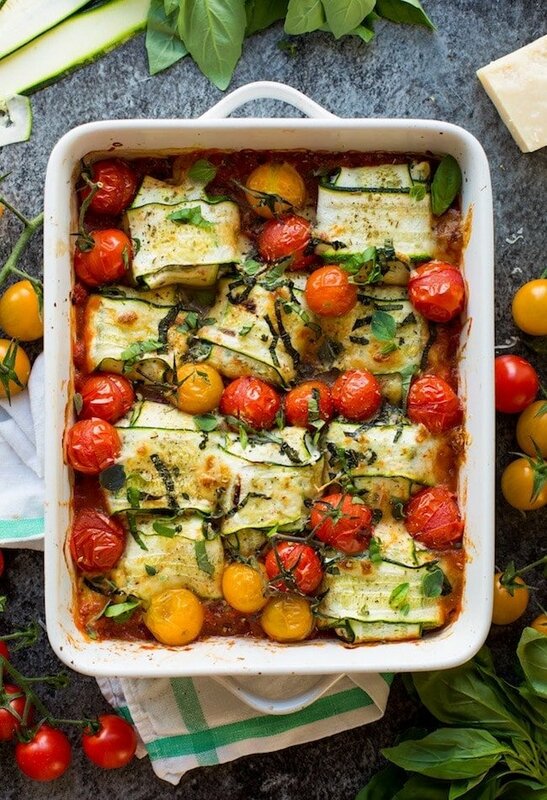 Lay the zucchini parcels across a roasting dish prepared with marinara and top with the cherry tomatoes and sprinkle with your remaining cheeses. After a 20 minute roast in the oven followed by a quick broil to finish off you’re all set to go! 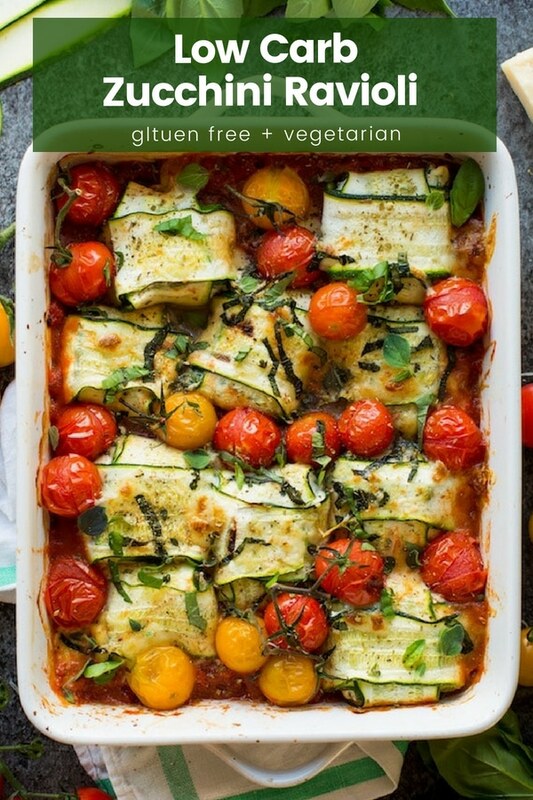 Zucchini….is there anything it can’t do? I think not. Don’t forget to #asaucykitchen on instagram if you try this Zucchini Ravioli! I’d love to see what you make with it! You can also post your pictures to myfacebook page! Spread out the marinara sauce across the bottom of a large roasting dish. Make your zucchini noodles with a mandolin or vegetable peeler. Peel the zucchini into 1/4 inch wide strips. Lay them out on a paper towel lined surface and sprinkle with salt. 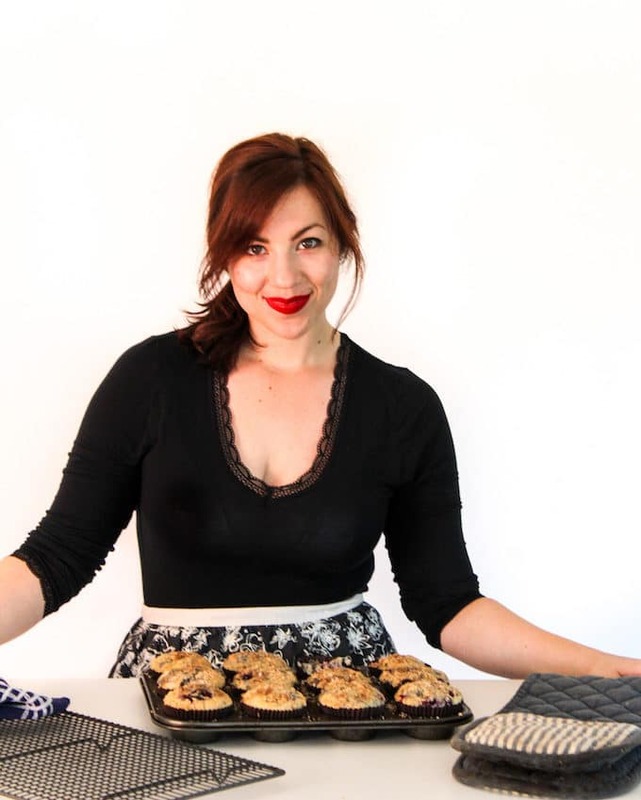 Set aside while you prep the rest of your ingredients. Add the olive oil to a medium sized skillet and bring to a medium low heat. Add the spinach and cook until wilted. Add the garlic to the pan and cook for a minute or two until fragrant - stirring the whole time to keep from burning. Turn off the heat and remove the pan from the hot burner. Add the spinach and garlic to a bowl along with the ricotta and chopped basil. Stir to combine. Return to your sliced zucchini and blot off the excess moisture. Take three strips of zucchini at a time and lay them out on a clean surface. Lay out the first two strips to form a lower case 't'. Line the top zucchini strip with the bottom layer. Spoon about 1 tablespoon of the ricotta mixture onto the centre of the zucchini. Fold the ends of the strips over the ricotta mixture to create little 'ravioli' parcels. Continue with the rest of the zucchini/cheese. Transfer the folded zucchini to the roasting dish and place on top of the marinara/tomatoes. Scatter the tomatoes over the top along with the mozzarella & parmesan. Bake in the oven for 20 minutes. Broil an extra 2 minutes to blister the tomatoes and then remove. Let cool for about 5 minutes before serving & enjoy! Sprinkle with additional basil if needed. 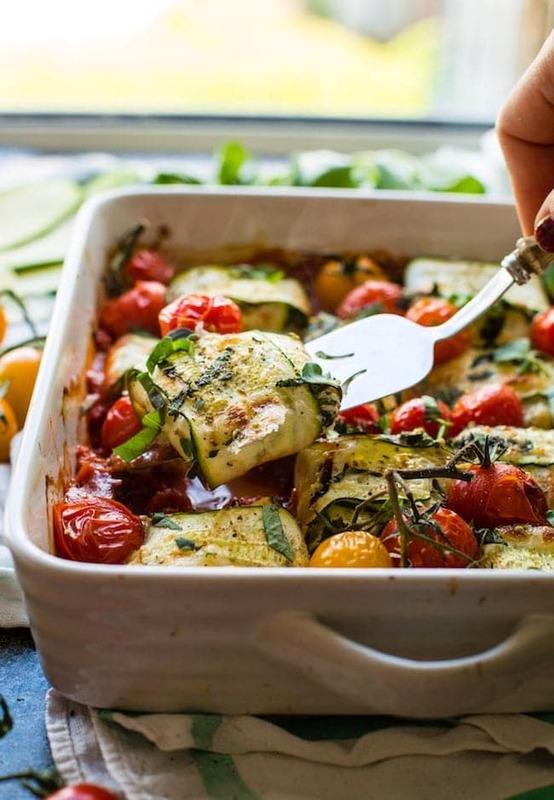 Both the zucchini & tomatoes naturally have a high water content so don't be surprised if your finished product comes with some extra liquid in the dish. If you don't like it you can either spoon out some of the extra liquid or blot it with a paper towel.